When renowned artist and puppeteer Tarish “Jeghetto” Pipkins took the stage at BU Central, all eyes weren’t on him. They were on his latest creation, Crush, a puppet made out of cardboard and cloth with two shining green eyes. With the help of his puppet, Pipkins hosted Boston University’s first puppet slam Saturday evening. 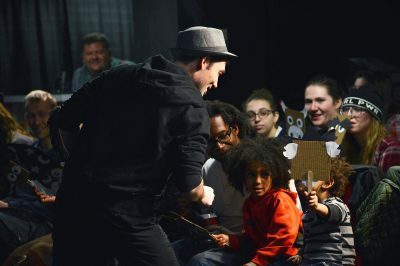 In addition to Pipkins’ performance, the puppet slam featured several students and BU community members who attended Pipkins’ workshops during the week leading up to the show. There, they created their own puppets that appeared in a wide range of musical, artistic and comedic performances. Monica Zielinski, a freshman in College of Fine Arts, worked with Pipkins when he came to visit her sculpture class. Over 15 students and community members performed at the puppet slam, according to Sarah Collins, assistant director of the BU Arts Initiative, who said Pipkins was brought to the Arts Initiative’s attention by CFA professor Felice Amato. Amato had seen some of Pipkins’ work before and wanted to bring him onto BU’s campus. Pipkins launched a career in puppetry in 2005. He cited meeting Fred Rogers, creator of “Mister Rogers’ Neighborhood,” and the film “Being John Malkovich” for inspiring him to work on puppetry. “There’s a magic in bringing someone into that uncanny valley where they suspend belief just for a second to react to one of the puppets I’ve built,” Pipkins said. The puppet slam concluded Pipkins’ residency at BU with the BU Arts Initiative, BU College of Fine Arts and the Puppet Showplace Theater. In addition to the puppet slam, the week featured various workshops, class visits and a panel discussion on “afrofuturism” — the study, through various lenses, of the intersection between black culture and technology. Pipkins’ week in residence also included two sold-out shows followed by post-performance discussions at the Puppet Showplace Theater, which presented Pipkins’ “Just Another Lynching: An American Horror Story.” Pipkins said he likes to have discussions after his shows to provide a space for people to talk openly about racism. “I would call it a workshop on racism,” Pipkins said, regarding his show. Pipkins said one reaction in particular stuck out to him — a man brought his young son whose best friend had just been killed by the police to the show. Though much of his work tackles racism, Pipkins doesn’t do his work to change other people’s beliefs, the artist told The Daily Free Press, because that change must come from within. However, Pipkins said he still believes that art can change people’s attitudes. “The only way to make social change is through art,” Pipkins said. “Legislation and rules and laws don’t work [because] it doesn’t change people’s attitudes. You can’t force an entire society to think a certain way — they have to come to that conclusion themselves. Art can spark that. Despite the personal nature of Pipkins’ art, performers and audience members at the slam felt the artist’s passion affect them personally. Sierra White, a junior in CFA, said she was also impressed by Pipkins, who spoke in one of her classes. White said that he changed her view on puppetry and she found him inspiring.